This Golf Cart Dash is designed for your Club Car golf cart precedent models 2008.5 and up. The dark wood grain finish gives you an elegant and customized look to your Club Car interior. 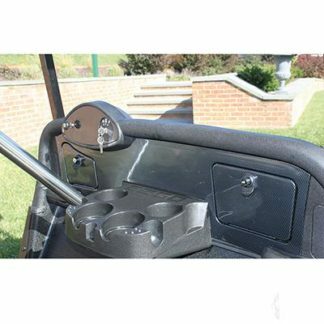 This Golf Cart Dash is the perfect item for those looking to customize their golf cart a little while adding functionality and flare. You can create a AM/FM/CD Stereo slot within easy reach while behind the wheel. Easy to reach integrated drink holders and two glove box type storage compartments that can be secured by key.